NEXT is open source project and everyone can contribute. 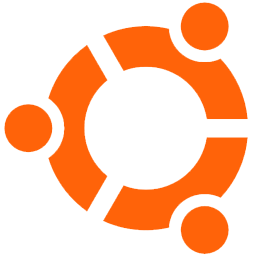 NEXT runs on Windows, Linux and MacOS. NEXT is an extremely fast and lightweight wallet. Easy to use, simple and elegant user interface. NEXT is a wallet that supports full node. You can earn %4 interest with NEXT. 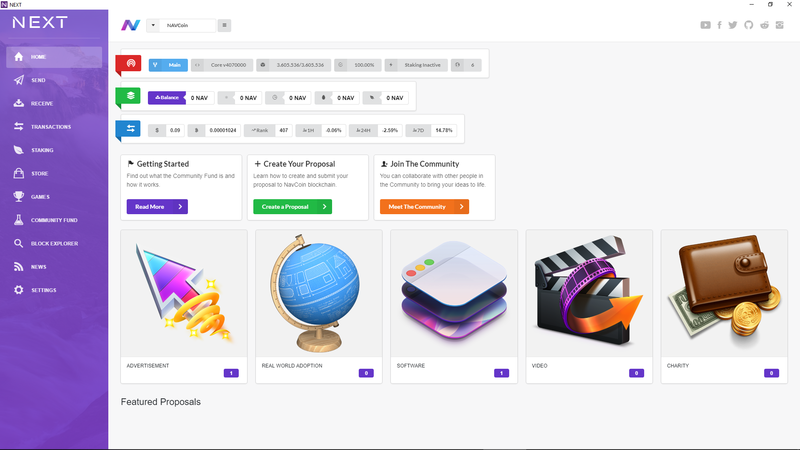 Proposal tab will allow users to view all Community Proposals and/or easily create a proposal. NEXT is a voluntary Community Project. You can contribute to the project by donating. Added Welcome window to application startup. Added Community Fund Information Cards to “Overview” page. Added “Getting Started” page for Community Fund. Added “Meet The Community” page for Community Fund. Added proposal counts by proposal categories to “Overview” page. Added version checking to “About” section. Added Current Voting Period details to “Community Proposals” section. Added Consensus variables to “Community Proposals” section. Added Proposal creation fee warning to “Create Proposal” section. Added “Available addresses” and “Available addresses with balance” groups to “Receive” section. Removed “Private Send” toggle button. Added support for PeerCoin, BlackCoin, ReddCoin, ZCoin, SysCoin, Crave, Digibyte, BitCore, VertCoin, SmartCash, GlobyCoin, Linc, Vivo, ZenCash, SocialSend, Bulwark, RavenCoin, EmerCoin, GroestlCoin. Automatic update preference for daemon binaries has been added to Settings. Added custom background image setting to coins.json for each asset. Fixed “space character” bug with application path. Updated Open Alias API URL for NavCoin. Added support for ARM and ARM64 devices. Hardware acceleration disabled for ARM devices. Added error catching for download daemon binaries from remote URL. Changed method for list available public addresses. Added Setup for first usage. Added “coins.json” file for dynamically list supported assets. Added LITECOIN, PIVX, DASH, CROWN, VIACOIN, PARTICL, PHORE support. Added In-Wallet asset switch dropdown list. Added “Update Preferences” to Settings. Added “Notification Preferences” to Settings. Added auto download/update feature for daemon binaries. Added custom drawn notification window. Added custom menu background color setting to coins.json file for each asset. Added OpenAlias support for NavCoin. Added tooltips to labels in Overview page. Changed Peer List Received/Sent from byte to MB. Added “Repair Wallet” section to Settings. Added “Backup/Import Wallet” section to Settings. Added “Encrypt Wallet” section to Settings. Added “Lock/Unlock Wallet” section to Settings. Added “Donate” button to Community Fund section for directly donate to Fund. Added “Unconfirmed” and “Immature” NAV amount to Homepage. Added Youtube link to Homepage. Added QR Code for new NAV address generation and existing NAV addresses. If wallet encrypted, NEXT will ask for password while sending NAV, creating community proposal and creating payment request. Added "Store" section for merchants. Added "NavCoin Daemon Logs" section. Added "NavCoin Accepted Here" section. Added "Instant Network Switch" button for easily change network between mainnet/testnet/devnet. Added "Open Data Folder" button to Settings. Added "Configuration File Editor" to Settings. Added "Show Master Private Key" button to Settings. Added "Sign Message" to Settings. Added "Verify Message" to Settings. Added "Table View" button to Community Proposals section. Added "Search" button to Community Proposals section. Added "Proposals by Status" information box to Community Proposals section. Added "Payment Request List" for each proposal in Community Proposals section. Added "Direct Donate" button for accepted proposals. Added "Create Payment Request" button to "My Proposals" section for accepted proposals. Added "Total Donation Amount" and "Number of Donors" info to Community Proposals section. Added transfer type filter to Transactions section. Added "Hide zero balances" button to Receive section. Added "Private Payment/Anonymous Send" option to Send section. Added CoinMarketCap actual data for NavCoin. Added "Auto Update" feature for application. Added "Owner/Team Members", "Web Site URL", "Contact E-mail", "Proposal Short Description","Proposal Long Description" fields to "Create Proposal" section. Upgraded NavCoin Daemon version to "v4.2.0-cold-staking". Added random password generation for NavCoin Daemon. Added secure wallet password support. Added "Please Wait" screen while application exiting. Added "Community Fund Stats" info box to "Community Fund" section for display actual Community Fund values like Available NAV, Voting Period Start/End. Added progress bars for each proposals Yes/No votes. Code signing was done for MacOS. Now asking for wallet password when sending NAV. Homepage now lists only Featured Proposals.